I admit to feeling a little melancholy this time of year. When I walk out the door I’m no longer greeted by a nicker from a mare in the foaling pen. Sometimes I even got a higher pitched nicker from a young occupant of the pen too. The foaling pen is empty because the mares and their foals are now at summer pasture. It’s a little later than usual for them to have made the move, so I got even more used to them being at home and being talked to many times a day. A very dry spring and hot dry summer have meant summer pasture has less than half its normal forage. Fortunately I had put in extra hay last fall so that keeping the mares at home longer was an easy option. While I may be a little melancholy, the mares of course are anything but. They are thrilled to be on green grass, first for a few hours a day and now 24/7. And trailering them to and from pasture is a great way to get their foals used to riding in big metal boxes on wheels. I am always so impressed when these flight animals so easily and regularly load into trailers to be transported. It helps of course that they know, at least in the case of my mares this time of year, that green grass is on the other end of the trip! The salve for my melancholy is of course knowing that my ponies are content. Green grass makes them happy, especially the mares with foals at foot. And I still get greetings, this time when I get out of the pick-up truck when I arrive to check on them. It really won’t be that long before frost nips the air and the ponies are all home again. Until then I am grateful for the blessing that summer pasture is and the mixed blessing that missing them is as well. It’s a good reminder how much I enjoy having them in my life. 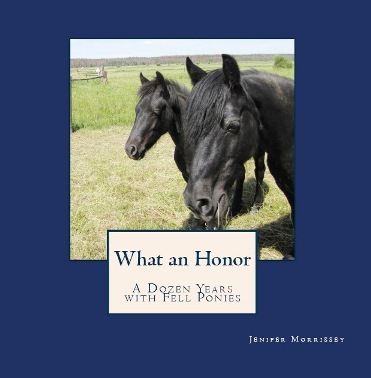 You can find more stories like this one in my book What an Honor: A Dozen Years with Fell Ponies, available internationally by clicking here or on the book cover.